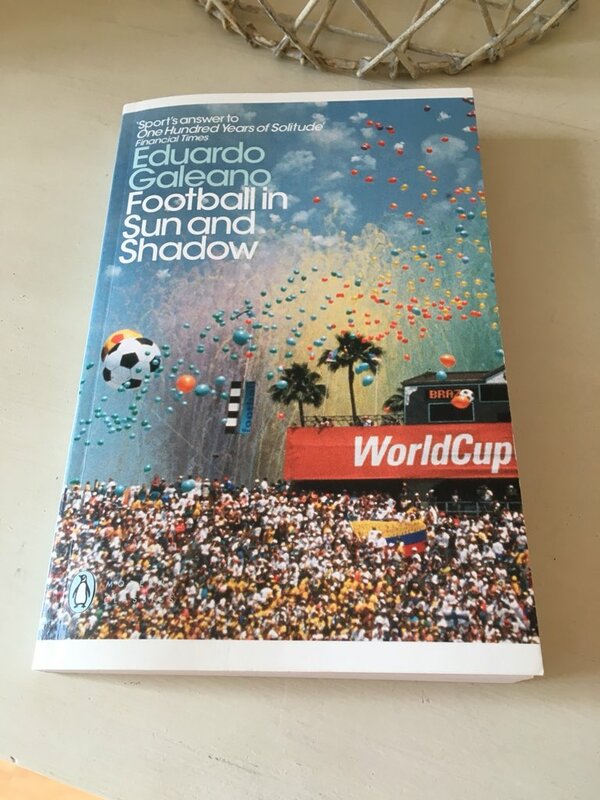 If you’re experiencing withdrawal symptoms from the thrills and spills of the 2018 World Cup, this could be the ideal book for you: Football in Sun and Shadow by the eminent Uruguayan journalist, novelist and writer Eduardo Galeano. First published in 1995 and subsequently updated to 2010, Football in Sun and Shadow is a marvellous collection of short essays/vignettes focusing primarily on each World Cup from the first in 1930 to the nineteenth in 2010. By adopting this approach, Galeano charts the development of the contest, touching briefly on the multitude of stars and the numerous dramas that have emerged both on and off the field over the years. In addition to providing an array of facts, this book is a wonderful paean to the artistry of football, capturing as it does the sheer grace, poetry and magic of the beautiful game. These initial snippets are followed by others which offer a potted history of the origins of football, its early development in Britain and subsequent arrival on the shores of South America via the sailors, diplomats and traders of the UK. Here the game is enthusiastically embraced in the early years of 20th century, particularly by the poor and underprivileged, blossoming in the slums of Argentina, Uruguay and Brazil where it requires little more than a makeshift ball and the sheer desire to play. Once the timeline reaches 1930, Galeano turns his focus to the World Cup, reflecting some of the highs and lows of each tournament, the main players and incidents with a particular emphasis on the most skilful goals. To give you an example, here is the writer’s portrait of Didi, the hub of the Brazilian team and leading playmaker of the 1958 World Cup. He was a master of the deep pass, a near goal that would become a real goal on the feet of Pelé, Garrincha or Vavá, but he also scored on his own. Shooting from afar, he used to fool goalkeepers with the ‘dry leaf’: by giving the ball his foot’s profile, she would leave the ground spinning and continue spinning on the fly, dancing about and changing direction like a dry leaf carried by the wind, until she flew between the posts precisely where the goalkeeper least expected. Each tournament is placed within the broader political, cultural and social landscape of the day by way of a brief summary covering key developments on the world stage – a technique which works brilliantly as an introduction, effectively putting football on a par with the other significant international events. The following passage is taken from the scene setter for the 1978 World Cup hosted by Argentina. That final line about the imminent fall of Castro is repeated in Galeano’s introduction to every World Cup from 1962 to 2006, acting a kind of running joke on the dictator’s position in Cuba. The vignettes that follow give a flavour of each tournament, the sights and sounds of some of the most significant matches and moments from the Cup. Fundamental changes to the game also merit a mention – for example, the introduction of red and yellow cards for the 1970 World Cup in Mexico, and the decision to award three points for a win in 1994 to discourage teams from playing for a draw. While the book gives a truly international perspective on the sport, Galeano’s passion for the game stems from his early love of the football played in his native continent of South America. He writes enthusiastically of a fluid, open kind of football, typified by Argentina’s River Plate team in the early 1940s, in which the players ‘traded places in a permanent rotation’ – in addition to their natural roles, defenders attacked and attackers defended. In particular, Galeano laments the decline of creativity and flair over the years, the increasing dominance of a ‘staid and standardized’ kind of football, ‘a game of speed and strength, fuelled by the fear of losing’. What saddens him most is the move towards teams of ‘functionaries who specialize in avoiding defeat’ rather than artists who have the freedom to express themselves with all the vision and imagination this unleashes. When a relatively rare example of creativity breaks through, it is a joy to behold. There is praise too for the Colombian team of the early ‘90s and Nigerian team of 1998. Galeano is equally scornful of the monetisation of the game – the increasingly lucrative television rights and advertising contracts play a crucial role here, often influencing the timing of World Cup matches to maximise the revenue gained from the European markets. Unsurprisingly, the dominance of FIFA merits a few mentions in this context, driven by the hard-nosed commercial strategy of its former president, João Havelange, a dominant force from the mid ‘70s to the late ‘90s. ‘I have come to sell football,’ he announces on taking up the presidency, a statement which seems to typify his values and general approach. Politics and money matters aside, what really shines through from Football in Sun and Shadow is the author’s sheer love of football – the myriad of myths and legends, the stories of heroes and villains, and perhaps most of all, the sense of artistry and magic that can emerge on the field. This is a wonderful testament to the creativity of football, written by a true poet and admirer of the game. I read this book for Richard and Stu’s Spanish and Portuguese Lit event which is running in July and August. Grant has also written an excellent review of it here. Football in Sun and Shadow is published by Penguin Books; personal copy. This entry was posted in Book Reviews, Galeano Eduardo and tagged #SpanishandPortugueseLitMonths, #SpanishLitMonth, #TranslationThurs, Book Review, Classics Club, Eduardo Galeano, Literature in Translation, Non-fiction, Uruguay on July 17, 2018 by JacquiWine.